Wiggo doubles up after winning this year's tour. Today Bradley Wiggins became the U.K.’s most decorated Olympian. 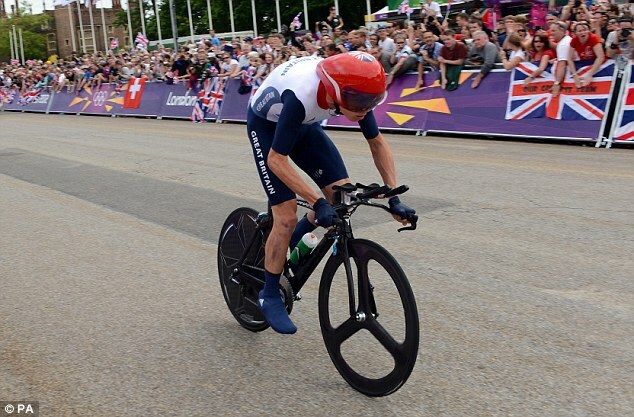 Wiggo, who won Wednesday’s 44km Olympic time trial in 50 minutes, 39.54 seconds, has now amassed seven Olympic medals. Impressive. It’s been a dream season for the Team Sky rider who just last month won the Tour de France (in doing so he became the first Brit to ever win the fabled bike race). It should be noted, though, that Wiggins earned his two recent victories on some unconventional equipment. For years now Wiggo has been using a set of non-circular chain rings made by Osymetric. Their odd square-egg shape is reminiscent of the old Biopace chain rings, but less oval than those antiques that were licensed by Shimano. Studies have been done on the benefits of non-circular chain rings but so far they’ve found no significant improvement in power, except for this one. The dead spot: Almost all of us have been riding round chainrings for so long we don't feel the mythical "dead spot" in our pedaling stroke. The chief benefit of Osymetric rings isn't the elimination of something none of us feel. Rather, because of their pseudo-elliptical shape, Osymetric rings concentrate your pedaling power where your force is at a maximum, while effectively reducing the load where your power input is at a minimum. For example, a 52 tooth Osymetric chainring is designed to mimic as a 56 tooth conventional ring on the downstroke and then act like the equivalent of a 48 tooth at the very bottom of the stroke. Ratios: Due to the variation in your effective chainring size throughout the pedal stroke, Osymetric rings don't come in a 53/39 combo. Rather, the "standard" ratio is 52/42 to optimize your pedaling forces. I've tested it in a variety of conditions from board flat criteriums to spirit-crushing climbfests. On both extremes (high and low) I never missed my 53 and 39. Early during my test of the rings, I struggled on one sustained 20 percent wall. Knowing I was in a 42 rather than my customary 39 may have led to a case of the yips on that climb. In retrospect, perhaps it shows that while there's little conscious physical adaptation required (see "Thump thump" below) after switching to Osymetric rings, they may require a period of mental adaptation. It’s weird but it obviously works for Wiggo. There are a few riders in Bend that run them, but at $300 for chain rings only, they aren’t cheap. But what’s a little coin for a legal performance improvement device?